Dental implants are a terrific option for replacing missing teeth. The implants are usually formed out of titanium and function as artificial teeth and roots that are surgically attached to your jawbone. Unlike dentures, an implant is a permanent structure and provides great stability for any other dental fixtures you might wear. The teeth are very natural in their appearance and are known for restoring beautiful smiles! Although dental implants are created for long-term use, they may occasionally need to be retightened or even replaced due to daily wear. Dental Implants require multiple appointments spanning over several months. The first phase of the process involves surgically implanting an “anchor and post” in the jaw. The second phase places an artificial tooth over the post area for long-term use. The team at Montgomery Dentistry will first take x-rays and then make a mold of your teeth and jaw. Once your mouth and tissue placement are assessed, a dentist will numb the area where the implant will be embedded. Then the implant will be surgically inserted into the jaw bone and allowed to heal there for up to six months. This time not only allows the area to recover, but also gives the implant time to assimilate with the surrounding tissue. Depending on which type of implant you choose, a follow up surgery may be required for post placement, which helps to anchor the implant. Another type of dental implant includes the post and anchor all in the first surgery. Once the surgery area has healed over several weeks, artificial teeth will be made based on post placement and the surrounding teeth and jaw line. Fitting the artificial teeth to the post is an important step in the process and may require several fittings to be accomplished, sometimes as long as a month or two. After the area has healed and the artificial teeth are secured, the patient can expect terrific tooth stability and long-term comfort with the implant. 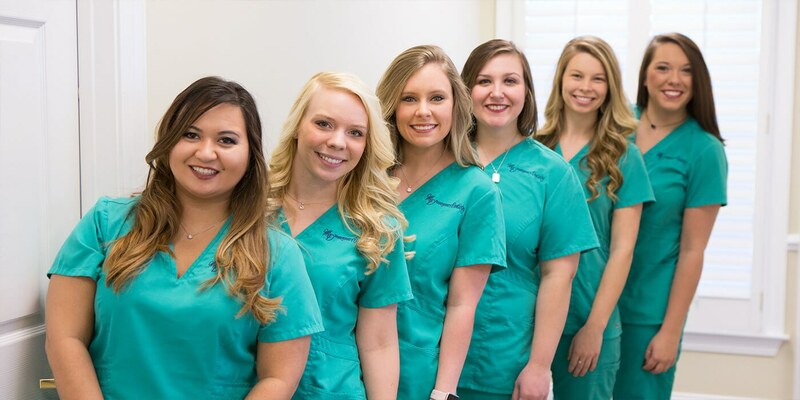 As always, the Montgomery Dentistry staff will provide the patient with instructions for care of the new implant.